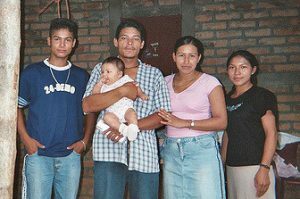 Families living in the “red zones” of El Salvador, Honduras, and Guatemala face daily gang violence, and the risk of losing their children to gang recruitment. The countries of the Northern Triangle of Central America (NTCA, comprised of El Salvador, Honduras, and Guatemala) are consistently ranked among the most violent countries in the world. In 2015, El Salvador topped the list with 103 homicides per 100,000 residents (making it the most violent country not at war); for Honduras, that figure was 57 homicides, and for Guatemala, 30. By comparison, the U.S. homicide rate was 5 per 100,000 residents. In the NTCA, a large portion of these astounding statistics is attributable to gang violence. How did this gang culture develop? What is its reach and impact? And what can help stanch the bloodshed, heal communities, and keep individuals and families from running for their lives? A VIOLENT HISTORY: The civil wars in Central America (1979–1992 in El Salvador, 1960–1996 in Guatemala) created a legacy of economic instability, authoritarian rule, and fragile institutions the NTCA has never fully recovered from. The U.S. played a pivotal role in spurring this unrest, by undermining democracies and backing military dictatorships, as well as using Honduras—already deeply affected by its neighbor’s hostilities—as a staging ground to train the right-wing Contras to fight the Sandinistas in Nicaragua’s civil war. With approximately 275,000 killed in the Salvadoran and Honduran conflicts, and both the pre-existing and ensuing regional stresses—poverty, family disruption, unemployment, dislocation, availability of firearms, weak criminal justice systems, rampant corruption, and sense of hopelessness among citizens—the NTCA experienced a “perfect storm” of conditions for continued violence. Almost 2 million people had sought refuge in the U.S. during the civil wars; those from the NTCA settled in Los Angeles where many youth overcame feelings of loss and exile by seeking brotherhood and connection in gangs. When the U.S. deported Central American immigrants with criminal records in 1996, L.A.-based gang members among them, it essentially exported gang culture to the NTCA. Although the civil wars are long over, today’s “war zones” are the “red zones” where gangs maintain control. GANG RECRUITMENT: Estimates of gang membership in the Northern Triangle range between 55,000 and 65,000, and hardline policies and mass incarceration (see below) have consolidated their power, creating opportunities for recruitment in prisons as well as the broader population. Even as gangs have grown more sophisticated in their organization and reach, their members are largely “just kids”—teens and pre-teens, as young as 10 years old, no tattoos or bulked-up physiques, who live in poor communities where inequalities flourish—and are often directed to commit horrific crimes. Incentives abound: the illusion of safety for themselves and their families, status, respect, protection from bullying, loneliness, and boredom. Most of all, when young people join gangs, they experience fleeting relief from the stresses and enduring threats of violence that others who refuse gang pressure are subject to. At such a young age, before developing the maturity or experience to weigh options, some imagine they will prosper, but for most, gang membership is a subsistence proposition. In El Salvador, low-level members net about US$40 a month, compared to the US$100 they would earn working an agricultural job. Often, their earnings amount to just enough to buy food, and their commitments can prevent them from continuing their education which would be a route to better job prospects. In addition, these “mafias of the poor” are difficult to leave once joined, and re-entry is a problem. Though engaged in brutal crimes themselves, these young gang members are also frequently victims. Extortion is ubiquitous, with gangs targeting both individuals (by setting up roadblocks) and small businesses, many in transportation. When a Salvadoran bus owner decided to stop pay his daily dollar to the local gang, they killed him three weeks later—over a mere US$21! These small “fees” add up, and paint a picture of pervasive criminality. La Prensa, a Honduran newspaper, reported in 2015 that gangs collected more than US$550 million throughout the Northern Triangle. These crimes go underreported for the usual reasons—fear of reprisal or death, inadequate law enforcement, distrust of government organizations, and a sense of futility. Poor apprehensions, investigations, and prosecutions are pervasive problems, to the point of institutional delinquency. As many as 95% of crimes go unpunished, and the majority of murders go unsolved—only one in 20 reported murders are solved in some regions. Victims often have no protection or recourse, nor even the option of internal relocation, since the scope of gang connections can encompass the entire country. THE IMPACT ON MIGRATION: Not surprisingly, gang activities and threats, among other forms of violence, are becoming a more dominant reason for migration from the NTCA, sometimes overtaking economic opportunity as the primary motivation. Doctors Without Borders found that, among the Central American migrants they aided and surveyed in Mexico, almost 40% had experienced attacks, threats to family or self, extortion, or recruitment in their home countries; 43.5% had a relative who died due to violence in the past two years (in El Salvador, this figure was 56.2%); 54.8% of Salvadorans were subject to extortion (another study reported 70%); and 17% of NTCA migrants knew someone who was kidnapped for ransom. As relates to U.S. apprehensions of migrants crossing the southern border, while illegal entry has reached historic lows, those who cross are much more likely to be fleeing violence. Recent demographics show that there are fewer male migrants seeking jobs and many more families, unaccompanied minors, and pregnant women escaping life-threatening violence. As these numbers of people fleeing violence continue to rise, one study determined that, between 2011 and 2016, for every additional homicide per year in the NTCA during that period, 3.7 more unaccompanied minors were apprehended in the U.S.
EFFORTS TO STOP GANG VIOLENCE: Government responses in NTCA countries over time have been focused on crackdowns and force, collectively known as Iron Fist (or mano dura). Reliance on the military and unregulated, understaffed police forces have resulted in extrajudicial killings, wrongful arrests, mass incarceration, and gang retaliations. Though initially popular, these strategies have been counter-productive, though nevertheless still applied. It is only in recent years that efforts are moving toward adopting rehabilitation, reintegration, and community-policing efforts, which have been shown to be more successful in diminishing gang violence, curtailing recruitment, and providing viable alternatives for at-risk youth and former gang members (e.g., training programs and assistance for job-seekers). Regardless of approach, anti-violence initiatives tend to be underfunded—NTCA countries do not have the revenues or resources to solve gang violence on their own. The U.S. has provided aid over the years, but mostly for law-enforcement, counternarcotics operations, and criminal justice systems, stipulating that monies cannot be used for programs that engage gang members directly. However, as evidence of the effectiveness of rehabilitation and reintegration mounts, the U.S. is starting to come around, slowly investing in more varied, integrated, and long-term approaches. Yet U.S. immigration policy—starting under Obama, and weaponized under Trump—continues to contribute to NTCA violence through policy decisions, an external “iron fist.” Mass deportations, family separation, and limited definitions of asylum grounds (reinforced by Attorney General Sessions’ June announcement despite its violation of human rights) mean that people fleeing violence are sent back to the perilous situations they left. There, the cycle of poverty, unemployment, extortion, dependence on smugglers, instability, and kidnapping and murder is exacerbated by the return of deportees—more potential victims of exploitation and violence. CONCLUSION: Gang violence in the Northern Triangle is nothing short of a humanitarian crisis. Inadequate or misdirected funding and hardline enforcement without engagement are not the answer. Nor are strict U.S. border policies, which attempt to divert rather than address the crisis and, additionally, do not have the intended effect of deterring immigration when people are fleeing for their lives. Ideally, a combination of prevention, enforcement, and rehabilitation are required on the ground, and U.S. immigration policies need to honor the spirit of the 1951 Convention and the right to seek asylum, working on ways to manage the flow of asylum applicants, encourage receptivity to claims of credible fear, and offer protection instead of repatriation to all who are in danger. Moreover, the root causes of violence must be prioritized, by funding initiatives that address poverty, education, and employment overall. With nearly 350,000 NTCA immigrants set to be deported now that their Temporary Protected Status in the U.S. has been revoked, and home countries ill-equipped to receive them, the situation will only grow more dire. Our advocacy in these areas—U.S. aid to halt violence in the NTCA and its root causes, sensible and humane immigration policy, updated application of asylum law, and defense of human rights—is critical. The KBI works on all these fronts, heeding our mission to promote humane, just, and workable immigration policies and accompany migrants in their time of need or fear. We urge you to join us, and by whatever means you can—letters to congressional representatives, donations to advocacy groups and NGOs, and spreading the word—to help to stop the violence. Is there any services created by HomeBoy in LA that could be duplicated for gang members in the Northern Triangle?